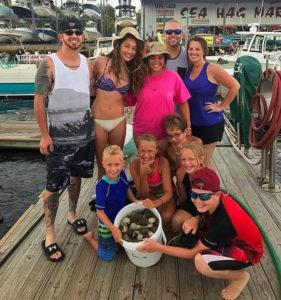 What a great month July was! 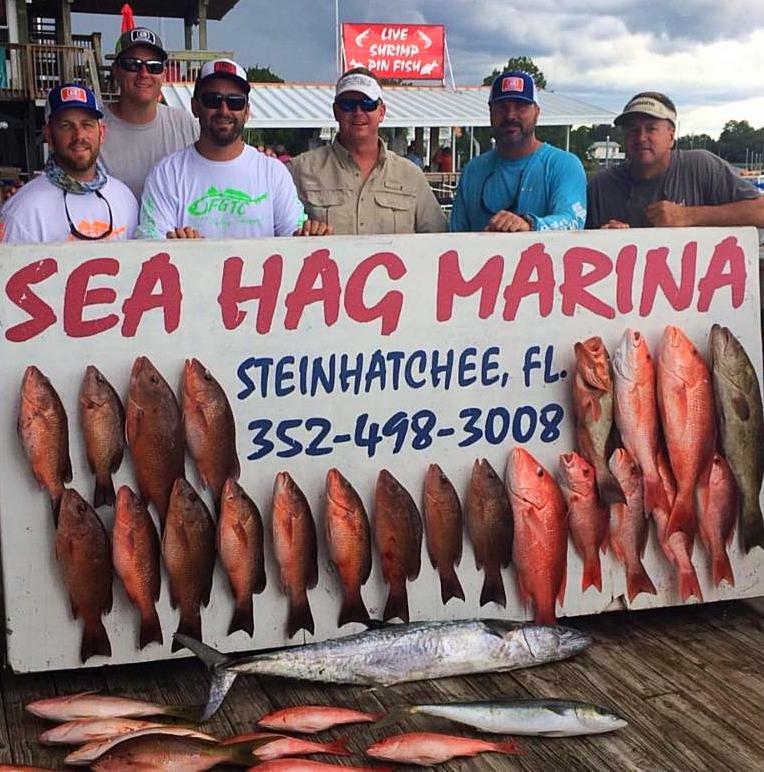 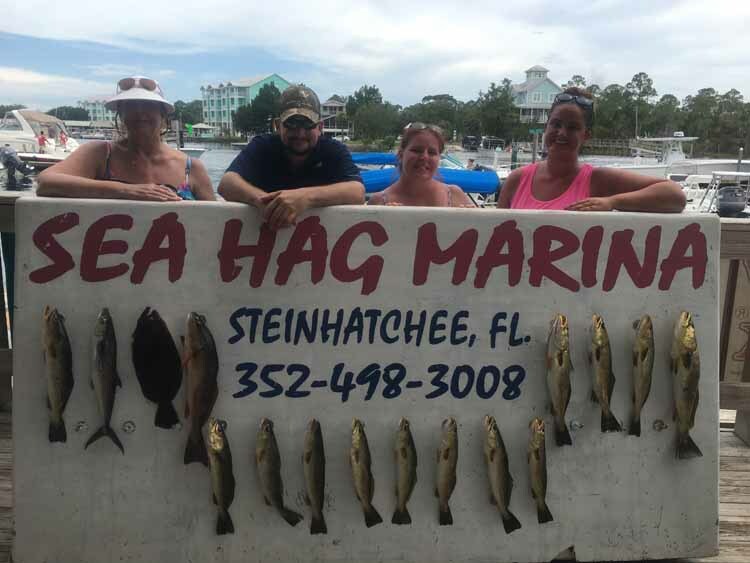 Inshore, offshore, scallops….Steinhatchee had it all this month. 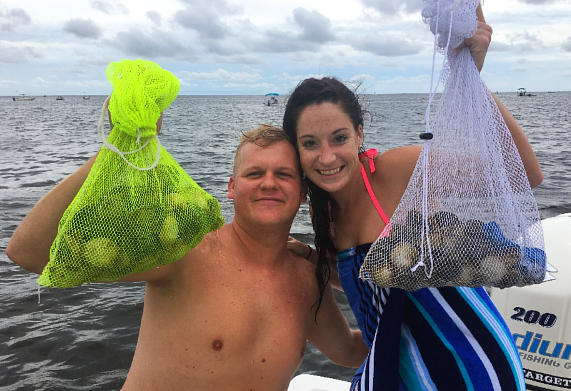 We had the usual afternoon storms, but the heavy rains stayed away so the flats remained clear, making it easy to collect limits of scallops. Offshore, red snapper and red and gag grouper were brought in in nice numbers, and there were some monster cobia around offshore structure and some smaller keepers on the flats. 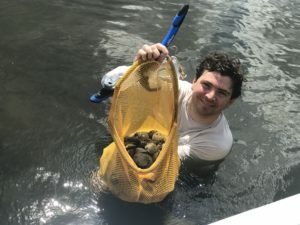 Here are some pictures from this month. 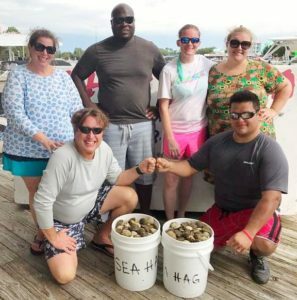 Ray Hedgecock and his crew took a long ride and it paid off. 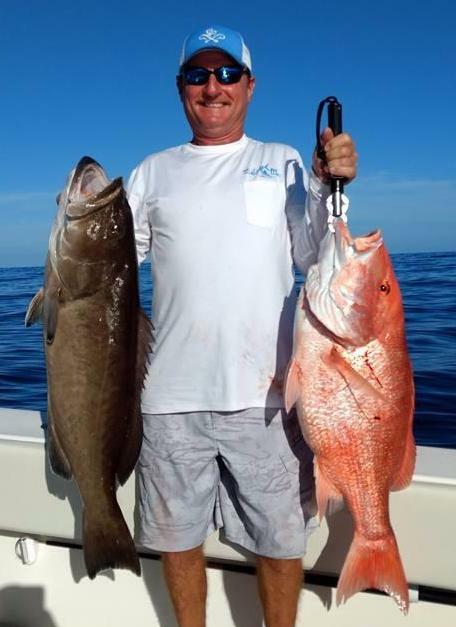 Steve Bradford with a huge gag grouper and a massive red snapper. Barbara and Chris Paredes, Jeff and Emily Savage, and Norman and Chris Garrison from Gainesville with their scallop limits. 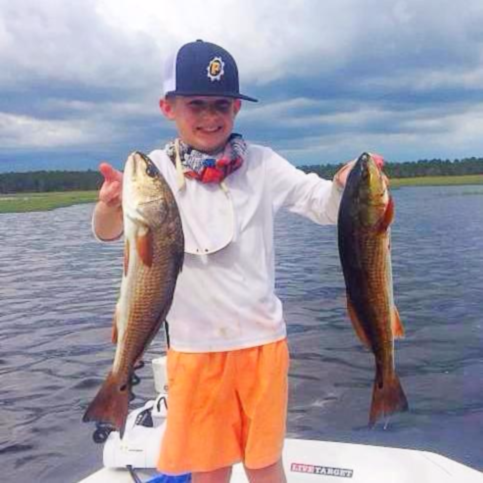 Bradford Ray with two redfish that were caught on topwater plugs near the shoreline. 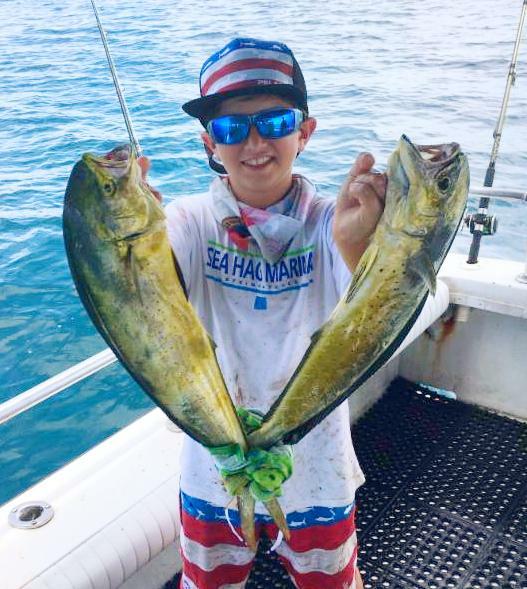 Haden Rust and his family went WAY offshore to find these mahi-mahi. Jana Akers and her son Jace had a great time on the scallop flats. 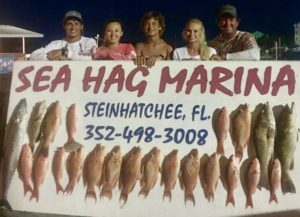 Sea Hag’s first family, the Norwoods and friends with a great offshore board of fish. 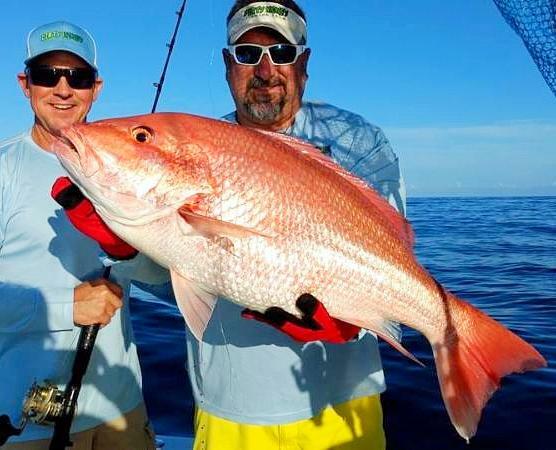 Eli Jensen with a monster red snapper. 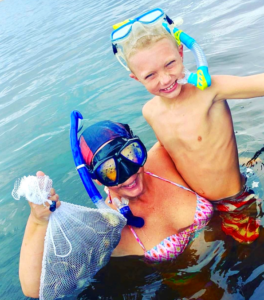 Abby Fleming and her son Sawyer had a great scallop trip. 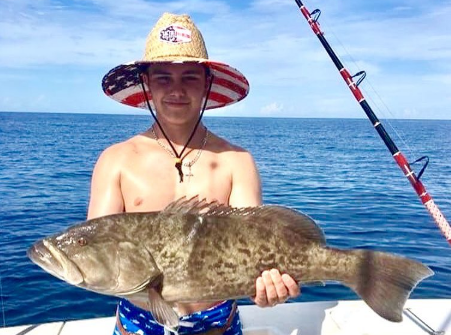 Landon Mask with a great pair of gag grouper. Michael Ross with a beautiful upper slot redfish. 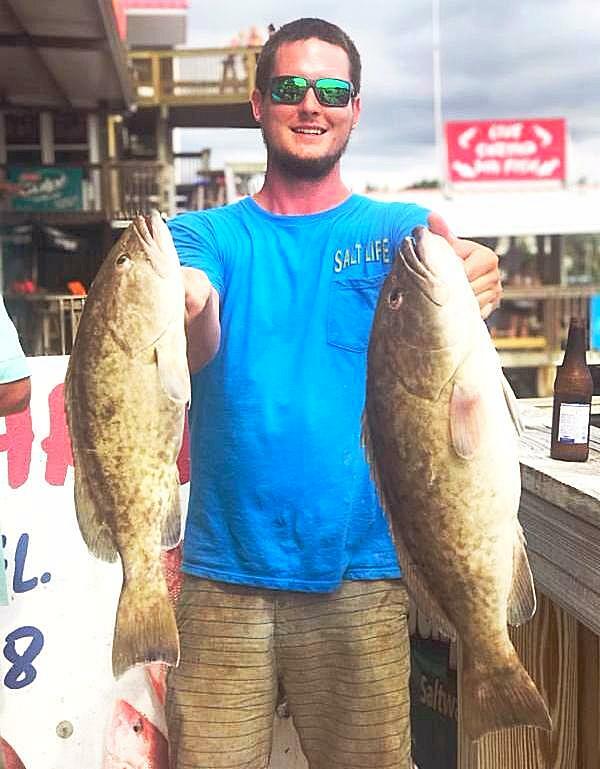 Dawson Rutherford with a few dinners worth of gag grouper. 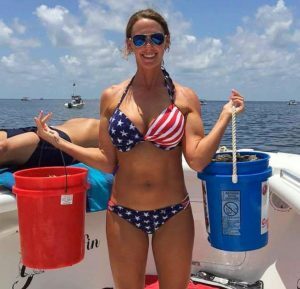 Karla Hobbs celebrated the fourth with a few scallop limits. 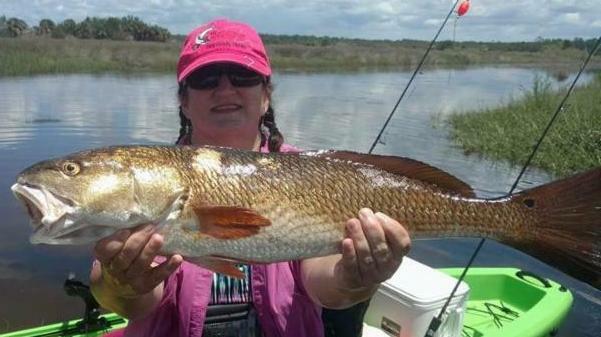 Dawn Taylor caught this nice redfish in a small creek. Hyden and Adrian Rust and Redlee Baggs were all needed to hold up this giant cobia. 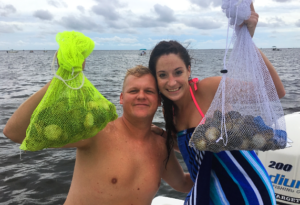 Haylee and Brandon from Lake Butler with their scallop haul. Mark Braddock found this nice gag grouper in 50 feet of water. 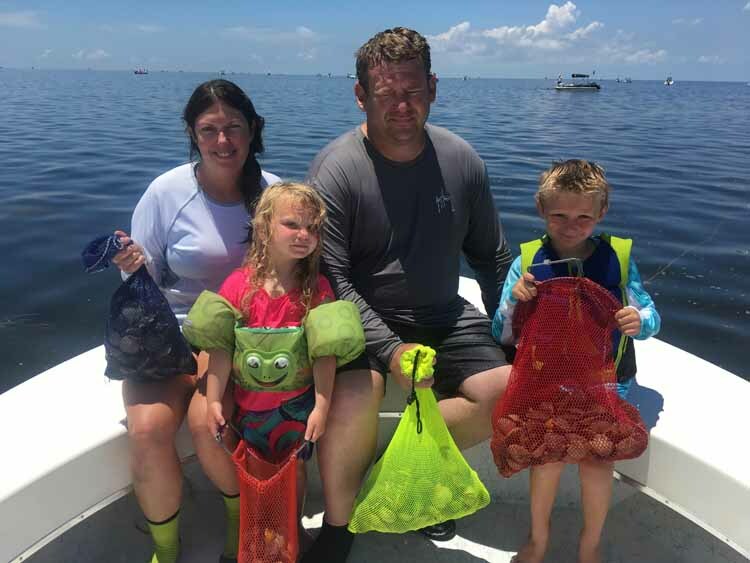 The Illisie family from St. Augustine had a wonderful scallop trip. 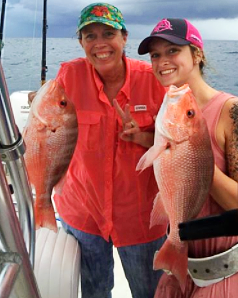 Cheyenne and Kathy Lee with some fine snapper for dinner. 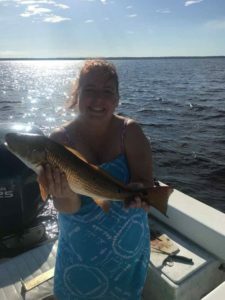 Vanessa Allen caught this beautifully colored redfish. 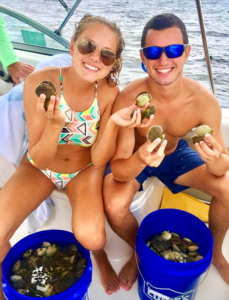 Lea Pafford and Michael Fernandez enjoyed their scallop trip. 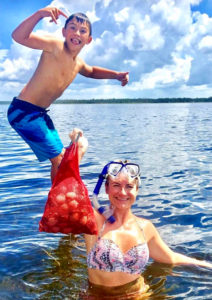 Connie Walker and her grandson Chris with a bag of bivalves. Dustin Murphy caught this nice redfish on a topwater plug. Big fish honors went to Jake Whidden with this 54 pound cobia. 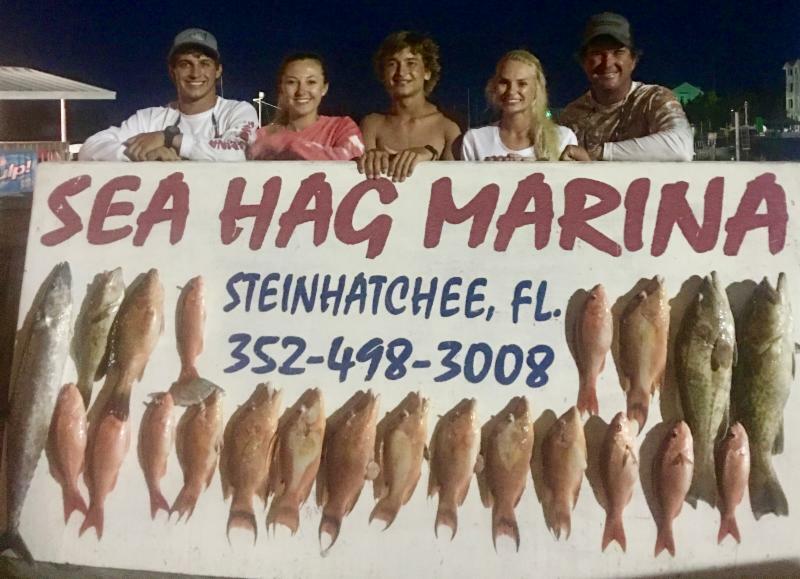 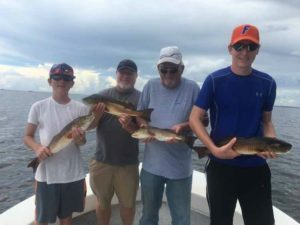 Offshore, although the charter season for red snapper is over, the recreational season is still in effect Fridays, Saturdays and Sundays June 16 through Sept. 4, including Monday, July 3, Tuesday, July 4, and Monday, Sept. 4. 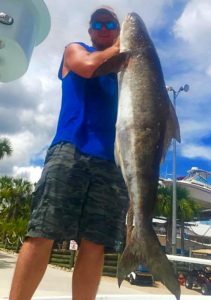 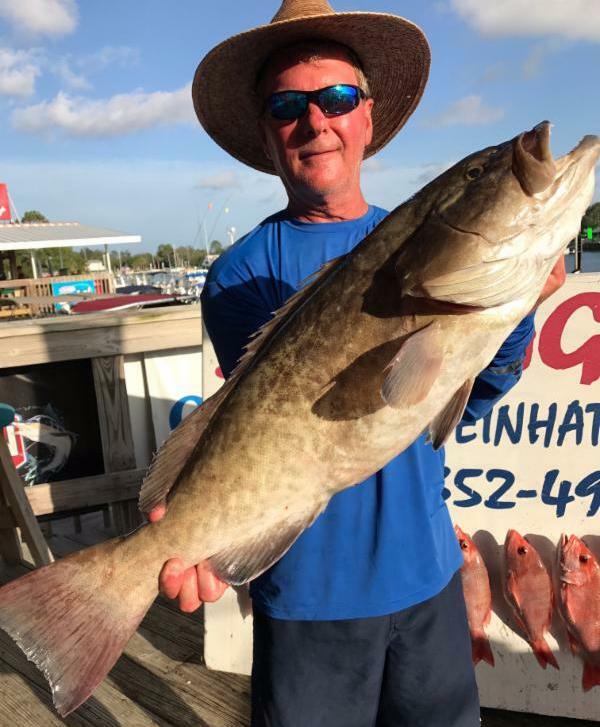 Gag grouper are also open, so if you’re willing to make a long run to fifty feet or so (or know of heavy structure closer than that), you can score some fine fish this month. 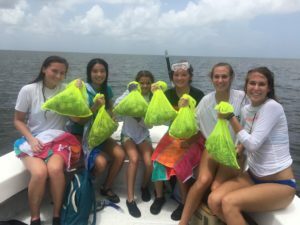 Frozen squid and sardines have been performing as well as live pinfish. There are still some nice kingfish around so put out a live bait under a cork while you bottom fish. 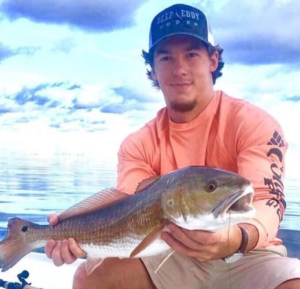 Inshore redfish can be found in good numbers; however, the water temps make them pretty lethargic. 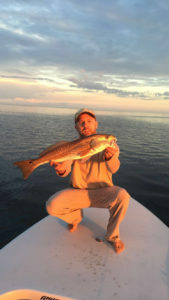 The key to fishing both trout and redfish this time of year is to be on the water at sunrise when the water is the coolest and the fish are most active. Fishing lures slowly like a winter pattern is also useful, and cut bait may be the best choice, especially for redfish. 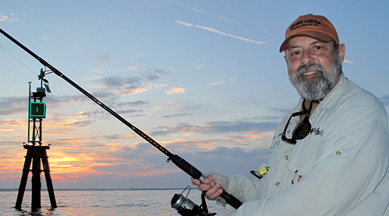 Fresh pinfish fillets work better than frozen mullet and expect to catch a few rays and catfish. 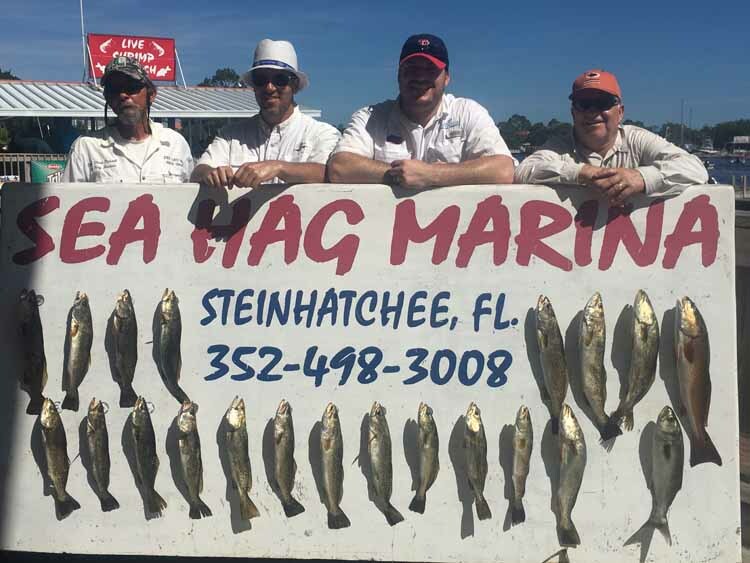 Look for areas with less floating grass if you are fishing artificials; near shore an hour after an outgoing tide starts up is usually a good bet as the grass floats away from the shoreline. 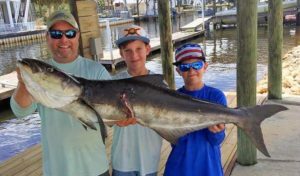 Texas-rigged soft baits, spoons and freshwater bass baits such as frogs that are made for fishing weeds are worth a try as well. 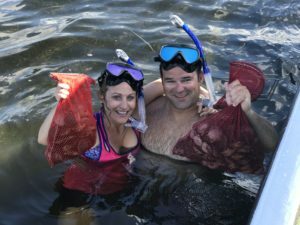 Scalloping will continue to be hot news as long as the water stays clear. 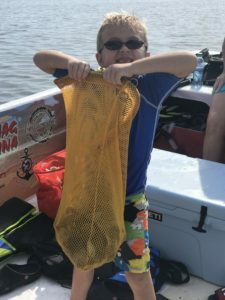 Remember that you must have a fishing license to scallop. The current hot spots have been directly out from Rocky Creek to the south and Rock Point to the north; you won’t have any problem finding the boats in those locations. Stay well hydrated, reapply sunscreen regularly, and after your limits find a shallow sand bar and have a party. 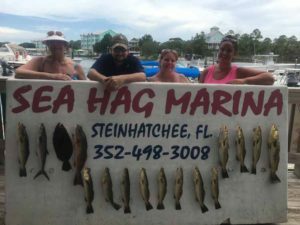 Remember that the Sea Hag marina can take care of all your scalloping and fishing needs. 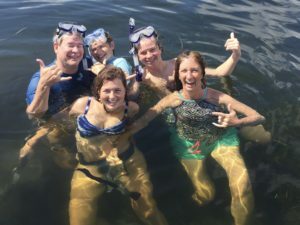 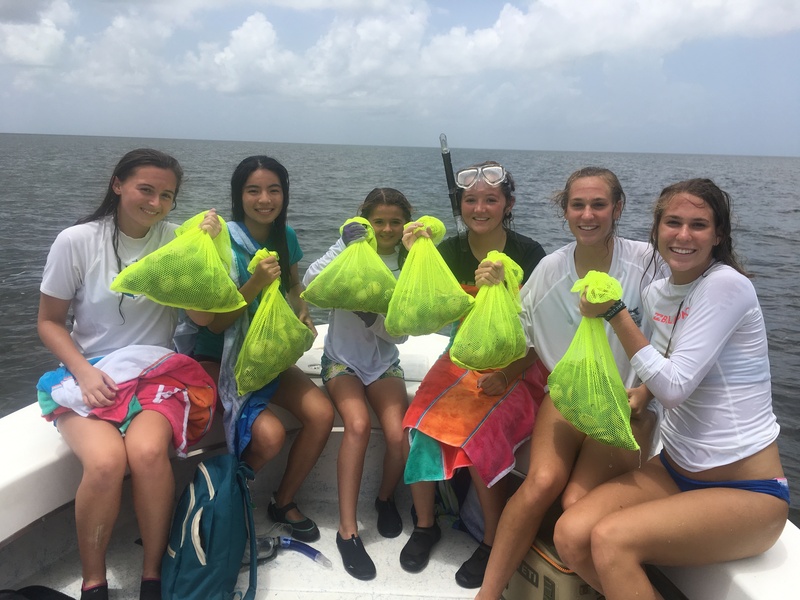 Although lodging on weekends can be very tight, come during the week if you can to avoid the crowds, and we have the newest fleet of rental boats that are just perfect to take large families out for scalloping trips. Don’t miss this month on the water! While scallop season is still in full swing there are still plenty of trout and red fish on the flats. If you want to catch fish or get scallops call me. Remember that scallop season ends September 10th, so don’t miss out. 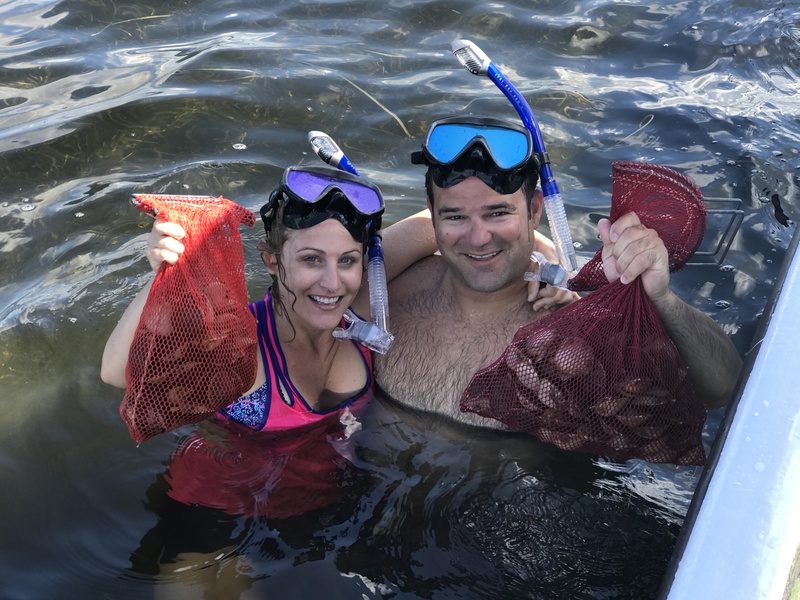 The scallops are still plentiful and the water has been clear. 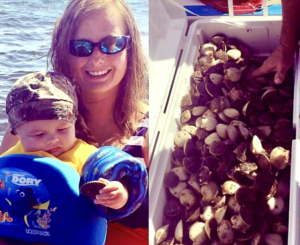 We haven’t been having any trouble limiting out and I still have plenty of availability for scallop season.